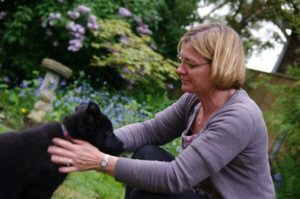 I am a full time training and behaviour consultant, having 30 years practical dog handling, training, and breeding experience. I have 2 dogs, one German shepherd and a working line Labrador. I have been a breeder of German shepherds under the affix of Aschenar since 1986. I have written detailed puppy booklets for clients. I competed in obedience, and the show world, set up puppy socialisation classes, ring craft classes, initially for just German Shepherds, then more recently for all breeds. I am a member of the APDT and was a TTouch Practitioner. I have advised and trained at various training clubs in Norfolk and Suffolk, where I have run workshops in TTouch, problem solving, puppy life skills, reactive rover rehabilitation. I designed and ran two boarding, breeding and training kennels between 1986 and 2004, during this time I trained students in kennel husbandry, dog awareness and handling. Provided residential training and boarding for difficult dogs, often, you guessed it; German shepherds. Oh and I brought up my 3 children, somehow and we were all owned by a beautiful Birman cat for 15 years who we showed and bred a litter with. Wishing to update my academic skills I completed the COAPE diploma in 2008 and subsequently was assessed as a Practitioner. My study continues at level 4 & 5 with COAPE.